Sometimes you are not given ideal weather to take photos in. You simply never know what the weather will be like the next day. Sleeping in is not the solution, going out and experiancing it regardless of the weather is the solution. 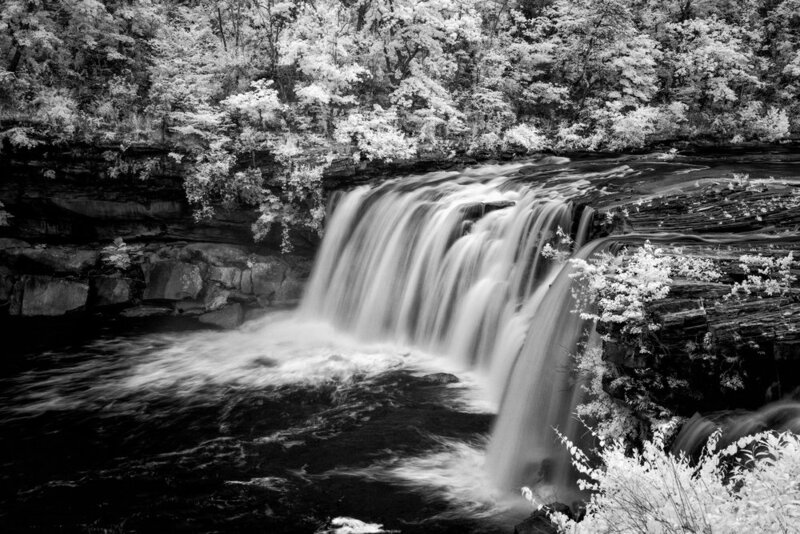 I have been to Little River Canyon many times in the past (See other photos here) . My sister has a home on Lake Weiss which is 30 minutes from the falls. I have posted photos of these falls in many conditions. High water, low water and ideal water levels. In the sun with no clouds, and with good light and dynamic clouds. But this weekend I had poor light conditions and low grey clouds. This wekend I also had a new tool to work with. I converted my old Nikon D800 to 800nm Infrared Camera. I was concerned I would not get the Infared "effect" considering the heavy cloud cover but I was very pleased with these results. I have learned alot about this camera and its conversion over the past few months and continue to hone my skills. The photo above was captured with the converted D800 (let’s call it the D800IR going forward), 24mm Lens at ISO 100, 1/4 Second at F/9. The post processing started in Nikon Capture NX-d where I set the white balance, I opend it in LightRoom to adjust contrast and exposure, moved it to Photoshop to swap the Red and Blue channels. Then back to LightRoom for the final adjustments which included midtone, highlight and Clarity. I also like to visit Desoto State Park while I am in the area, It is north of the Little River Canyon. There are several Boat Hopuses that photograph very well. The early morning light is great there. I have other variations of this boat house in my collection, I am often asked why I go back to the same locations. It is because of the constant change people and nature present us. If you looked at the links above to the other Little River Falls photos you saw the variation in weather and water. Here the owner of the boat house left me a nice contrasting color kayak that was not in previous photos.